Ever since his very public meltdown in 2006, Mel Gibson has had a very hard time trying to get back into the movie making game. Every time he would pop his head back up to make a potential comeback, the same routine would play out. The world would debate about when it was ok to forgive him, if we could, and if there should any future for him in Hollywood. Should the world celebrate a “monster” like him? This would come up when he made Edge of Darkness (2010) and The Beaver (2011), two high profile releases. The public relations nightmare seemingly sent Get The Gringo (2012) to DTV limbo. And he would make glorified cameos in C grade actioneers in Machete Kills (2013) and The Expendables 3 (2014), but they weren’t high profile enough to really garner anyone’s ire. But 2016 saw Gibson making inroads toward coming back, earning Oscar nominations for his return to directing, Hacksaw Ridge. Yet this return brings up some moral quandaries about engaging with the art of someone with a less than stellar moral record. In the years since the meltdown, Mel hasn’t exactly been forthright about any potential growth. He has never been completely transparent about his personal life, giving vague statements whenever someone asks. Even recently, in a Hollywood Reporter roundtable with other award-nominated directors, he never explicitly says what he’s done to grow or why he’s had to change. So there’s a contingent of people who can’t forgive him and will never see his work again. But with his return this year, directing Hacksaw Ridge and starring in Blood Father, he seemingly made an unexpected choice: to explore themes that reflect on his personal life. Gibson’s work has always focused on redemption, with heroes having to spill either their own blood or the blood of others. It’s a highly Catholic approach, one of the few similarities he has with Scorsese. But in Hacksaw Ridge, he decides to focus on a man who has no interest in shedding blood. 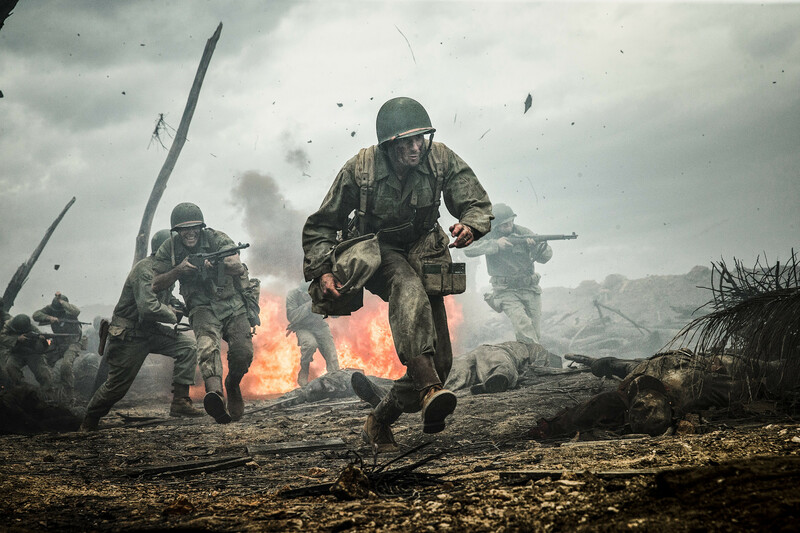 Desmond Doss, a pacifist, wants to go to war to save the men who are fighting, but his religious principles forbid him from doing any killing himself. This is a real change for Gibson, and you can see why he would be interested in this story. Doss is disinclined to commit acts of violence because of two moments in his past when he almost crossed the line and did something irredeemable. These moments are intertwined with the damaged relationship he has with his father, a horrible drunk filled with violent regret and anger. Instead of being poisoned by his father and turning into a reflection of him, Desmond went the other way. He saw what came from a life of misery, saw the toll that going to war had taken on his father, and he didn’t want it. He’d rather die on the battlefield doing good than live in violation of his principles. Gibson’s own father was an anti-semitic Holocaust denier and an angry drunk, all of which were reflected in his son’s meltdown. For Gibson’s comeback to be a movie that idolizes a nonviolent man repudiating his father’s hatred seems like a purposeful choice. And it wasn’t the only movie he made this year dealing with the issue of horrible fathers. In his attempt to return to the mainstream, Gibson stepped in front of the camera with Blood Father. His role is very heightened version of himself, as he doesn’t have the backstory of a highly violent ex neo nazi biker, but is similar enough to himself that it’s hard to call it a coincidence. Here he is playing Link, an ex-convict who is trying to right the wrongs in his life when it’s turned upside-down by the return of his estranged daughter, pursued by cartel thugs. Link, like the man who plays him, had an angry and destructive life that caused a gigantic rift in his family, but he now throws himself fully into protecting his daughter. We even see him at an Alcoholics Anonymous meeting, talking very candidly about how awful he was in the past. Another intriguing moment comes when Link and his daughter are talking about Mexicans. Link has some “old man” opinions (they’re taking jobs and such), but he’s not angry or mean about it. When his daughter gives him a more informed opinion, he’s open to changing his tune. His issues come from ignorance, but he’s willing to grow. The kicker is in the details of his criminal backstory. He was a member of a neo-Nazi biker gang, taking the fall for a crime he didn’t commit to protect his “brothers.” But in the pen, he came to realize how phony this gang’s beliefs were, and he decided to shed the hate-mongering skin he used to wear. It all comes back to a father figure, too, in the form of Preacher (Michael Parks), the leader of the hate group who uses men like Link to further his cause without getting his own hands dirty. There’s a great scene where they reunite after much time apart. Parks shows his true colors, and Link goes off on a rant that has been boiling for years. It’s not a moment of a man passing responsibility for his crimes onto someone else, but of railing at the man he trusted for exploiting his weakness and sending him down the wrong road. Between this and the father issues in Hacksaw Ridge, Gibson seems to acknowledge the problems that plague him. These two films fit very much in Gibson’s wheelhouse while also containing gestures to show that he is aware of the darkness inside him. Gibson’s personal movies have always had positive portrayals of his protagonists’ fathers, but now he shows the ways a damaged father can affect a man — either ruining him, as with Link, or motivating him to change, as with Desmond Doss. These movies show us a man coming to terms with his youth. Gibson wants to be a Desmond Doss, but he has come to the realization that he is Link. A broken man led astray by the father figure he followed to the ends of the Earth, but whose beliefs that were instilled by the man turned him into a pariah. A broken man that has realized almost too late that he was led astray, but was able to turn the corner with just enough time to help save his daughter and show her a different way. And a broken man, like many a Mel protagonist, can only truly redeem himself by sacrificing himself for his daughter’s sake. This could just be part of his sacrificial narrative obsession, putting it in the same arena as Braveheart and The Passion Of The Christ. Or it could be another glimpse into Mel’s psyche. That the only way he can be of use to the family he hurt is from a distance. We talk about separating the artist from the art, and how that process is different for everyone. But when the artist is quite clearly trying to atone for his sins, maybe there shouldn’t be a separation. Maybe we can look at a man’s life as it’s reflected in his art. Because the two movies Gibson made in 2016 share some strong differences in their content than the movies he made before the meltdown. Could it all be a coincidence? Or a cynical ploy to make himself look better? Possible. But until evidence proves otherwise, the discussion around Mel Gibson isn’t as black and white as some would like to make it. In an industry that purports to be left leaning, many seem to be unwilling to accept that someone may have been rehabilitated. An industry that makes tons of redemption stories, many seem unable to allow the idea of Gibson having changed. Those people want to boycott his work and Hollywood for giving him work are being too reactionary. Because all art reveals something about the artist. We didn’t see the meltdown coming in his art. Maybe we can see the redemption. PCI Season 2 Episode 1: Whoops!